'Obama's Katrina' Turned Out Not To Be : It's All Politics Obama seems to have escaped deep lasting damage from the BP oil spill which once seemed unlikely. But the president may have helped his critics' narrative that he's killed jobs with his moratorium on Gulf oil drilling. President Obama in Venice, La. during the BP oil-spill crisis. There was a time this spring and early summer when President Obama seemed like another helpless shore bird, drenched in oil, unable to fly. USA Today asked if this latest Gulf disaster was becoming "Obama's Katrina." And the New York Times drew ominous parallels to Jimmy Carter, as TV's spill-cam offered a round-the-clock reminder of government impotence. 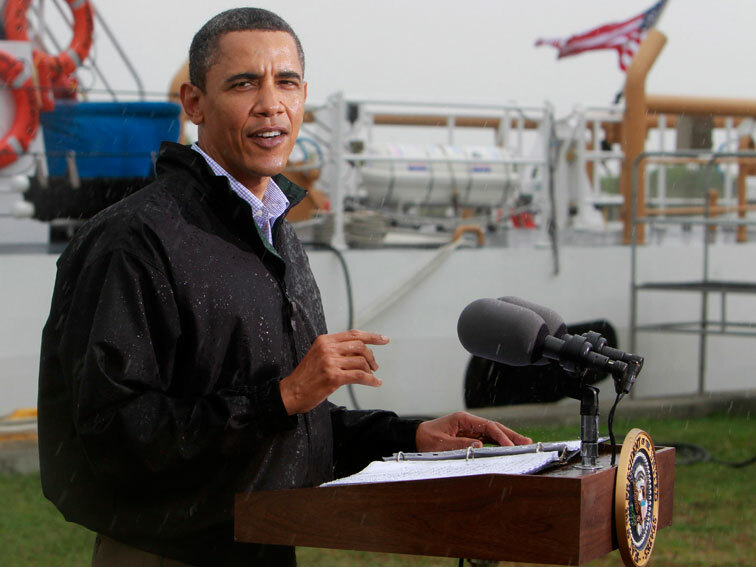 During a June meeting with Louisiana fishermen, Mr. Obama could only turn up his hands. Scott is absolutely right. The president did seem like a shorebird mired by oil. It was such a compelling image that editorial cartoonists found it irresistible as in this cartoon by Mike Lester and this one by Steve Bell. But the response was far from Obama's Katrina as some critics predicted or hoped, responding to the way the inept federal response to the 2005 hurricane badly weakened President Bush who was already damaged by the Iraq War. Still, it's a testament to how much the economy has overshadowed everything else, that the Obama Administration's management of the oil spill crisis seems to be almost an afterthought as we approach Election Day. Indeed, if the president suffers any continuing damage from the oil spill, it's on the jobs front as well, his six-month moratorium on Gulf oil drilling whose end was recently announced. His Republican critics have been able to connect that moratorium and its impact on oil sector jobs to their narrative that the president's fiscal policies overall have been job killers.